Every year when it’s finally sweater weather, we notice numerous stylish ladies making the same mistake—that is, restricting their cosy knits to weekends and off-duty occasions. But a dress code shouldn’t come between you and your favourite sweaters, which are surprisingly easy to style for work and after-hours events. That’s why today we’re bringing you eight fashionable ways to get away with wearing a sweater anywhere from the office to a party! Wear a crew-neck sweater with an A-line skirt and pointy-toe pumps for an easy, elegant look suitable for work and play. Channel Elena Perminova’s western-inspired vibe by accessorizing a printed sweater with over-the-knee boots and a chic hat. Master cold-weather whites by pairing an oversized sweater with slimming black jeans and classic accessories. Effortlessly contrast casual pieces, like a boyfriend sweater and sporty sneakers, with polished, tailored pants. This black-and-white look is a breeze to recreate and transitions easily from day to night! Wear a turtleneck underneath a slightly loose-fitting dress, and complete your outfit with booties for an intriguing layered look. Extra points if you can emulate Leila Yavari’s fall palette. Tap into your feminine side by wearing a soft grey sweater with a sweet printed skirt and ladylike boots. For a cosy layering formula, try slipping on a coat over a lightweight sweater and your favourite denim jacket. 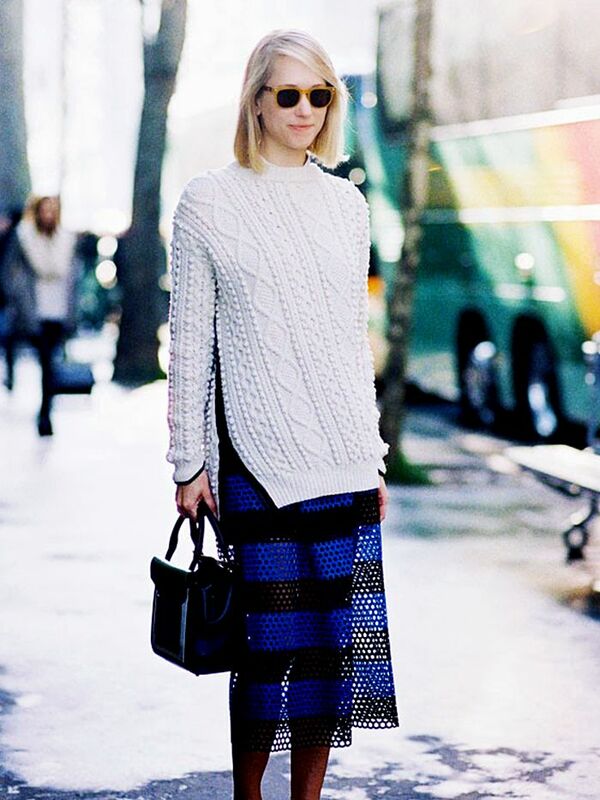 Looking for more sweater inspiration? Click here to see our gallery!